As you may know, Bill Buyok is the founder and owner of Avente Tile. He started the company as an online tile showroom and catalog so that hand-painted ceramic tiles and cement tiles are more easily and broadly available for others who share the same passion. Avente Tile's mission is to search the globe to find the finest and most extraordinary tiles for their customers while providing excellent service and product knowledge. With that in mind, here are the Designer Insights of Bill Buyok. Editor's Note: Bill Buyok's Designer Insights were originally published Tuesday, May 19 on the Terry's Fabrics Blog by Tudor Davies. It's only one in a collection of Designer Insights compiled by Tudor and his team that profile designers and design enthusiasts. We're honored to have been included in this collection, and thank Terry's Fabrics for this opportunity. If you enjoy Bill's insights, then be sure to visit the Terry's Fabrics blog and peruse all of the Designer Insights. The following transcript shows the interview questions and Bill's response to each. In your own words, describe your unique style and creative aesthetic? I’m drawn to classic Spanish, Moroccan, and Italian designs, the nature-inspired design of the Arts & Crafts Movement, and a love for Hispano-Moresque design. When starting a new project, what is your creative process? Listen to customers, understand their needs and wants. I start with facts, then develop the color scheme and apply pattern, motifs, accent colors and flourishes to establish design and personal style. Out of the creative people you have worked with, who is it that you respect and admire the most? My customers, who include designers, architects, and residential customers, often envision something extraordinary, unique and bold. Our cement tiles allow customers to create designs and apply color to a pattern of their choice, allowing them to control the creative design process. Thus, the tile’s pattern and color have now been reinvented into something beautiful that I would have never imagined. When looking for inspiration is there a particular thing you do to get inspired? During my early morning treks through Los Angeles neighborhoods, I find inspiration around me. I then turn those inspirations into design ideas that are unique, fun and useful. What has brought you to this point in your career? And what is your advice for people looking to follow in your footsteps? Work hard, persevere, and do what you love! Every day presents its own unique challenges that you have to translate to opportunity. Never give up and always believe in yourself. Remember, it’s not how you handle the best days; but, how you handle the challenges and disappointments that really matter. Last month, I reported some of my favorite tile trends and finds from Coverings in the my blog post Tile Trends 2015: Variety is the Spice of Tile. One of the most unique new tile designs I spotted at the show is a relief cement wall tile line from Aguayo Tiles called Elevations. Without further ado, Avente Tile is proud to announce the premier of this exciting design line of relief cement tiles. Elevations is a new cement tile in relief for walls. Shown here is Drop in the color Chocolate Mousse. Avente Tile partnered with Aguayo Cement Tiles a decade ago because of their generations-long commitment to producing quality cement tiles. This line is truly unique for the industry because it eloquently combines geometric shapes in both convex and concave relief that, and because of its extensive color palette of more than 60 colors. 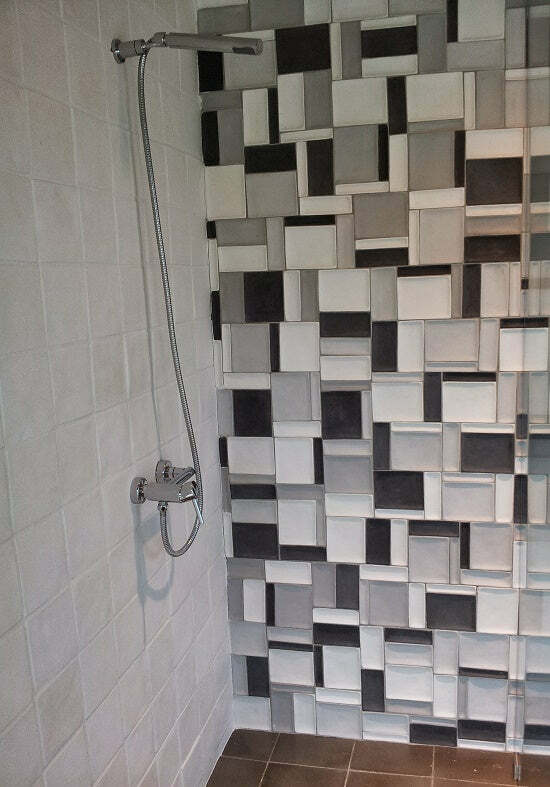 Elevations Concave Rectangles used as shower accent wall. Shown in black, white, and shades of grey. Six shapes are available: Drop, Concave Rectangles, Petals, 3D Hexagon, Concave Hexagons, and Angles. The edgy, contemporary designs of high relief geometrical tiles really stand out for their architectural value. They are suited for wall applications and can be installed with or without grout. Additionally, the tiles are available with a standard smooth surface or an optional waxed finish that provides a classy, satin sheen. The tile come pre-sealed with a penetrating sealer and are ready to install. 3D Hexagon tile in three shades of grey. Standard finish installed without grout. Angles relief cement tiles in grey with standard finish. These new, architecturally inspired tiles are available now. However, we recommend you purchase strike-offs in the colors you desire before placing a full order. Allow about three weeks for strike-offs to be made and delivered. Strike-offs are shipped via UPS International Air Freight from the factory and cost about $150-$200 per sq. ft. Discover the architectural collection of cement relief tile, Elevations, online now. When placing a full order, allow a lead time of 8 to 10 weeks for your tiles to be crafted by hand, carefully packed and shipped. Like all our cement tiles, these shapes can be customized with your choice of colors from the Heritage Color Palette. Tiles can be purchased with a standard finish or waxed finished. All tiles come pre-sealed from the factory with a penetrating sealer. If you have any questions, just contact us to let us know what you need. We've got more new cement tile lines that will be ready very soon. Next week, we'll show you our new Hexagonal Cement Tiles. Coverings 2015 provided us with some exciting new tile designs that we can't wait to share with you in the coming weeks. A few weeks ago, I shared 2015 Tile Trends from my annual pilgrimage to Coverings, a trade show for tile and stone. I promised to share some other great new tile finds that Avente Tile will be adding to our offerings. Not being one to disappoint, I want to show the new Cuban Heritage Cement tile offerings from Aguayo. The new Cuban Heritage colorways embrace the trends we have been seeing with color. You'll notice more straight-forward colorways using three or four colors. Also, you'll find slightly muted patterns using shades of gray and blue or warm earth tones and neutrals with an accent of color. These new colorways have been created with you in mind. We want to make it easy for the designer and homeowner to use cement tile in the home. These new colorways are available now. Although we have limited sample stock available at this time, we'll be adding these tiles to our stocked inventory and as a result, they'll be available for quick ship soon. With a focus on quality and distinguished look all their own (compared to other suppliers), our Cuban Heritage cement tiles all come with a polished finish. Polished tiles have a slightly satin surface sheen, the desired patina that all cement floor tiles naturally develop over time. Polished tiles are also easier to install because the slightly smoother finish makes grout easier to remove from the surface. Discover our entire Cuban Heritage Cement Tile collection online now. The "Series 3" colorways, like CH260-3B, will no longer be stocked. These colorways are still available with a standard lead time of 8 to 10 weeks. Like all our cement tiles, these patterns can be customized with your choice of colors, Just contact us to let us know what you need. Love Cuban Tiles? Find out more in our post, A Brief Overview of Cuban Tiles. It's not easy to get all of the new tile designs and lines we will be offering from Coverings 2015 ready. I came back from the show energized and excited to share new tile inspiration, trends, and products. I'll share more new cement tile products and lines as we launch them over the next six weeks. make for an incredible outdoor setting. 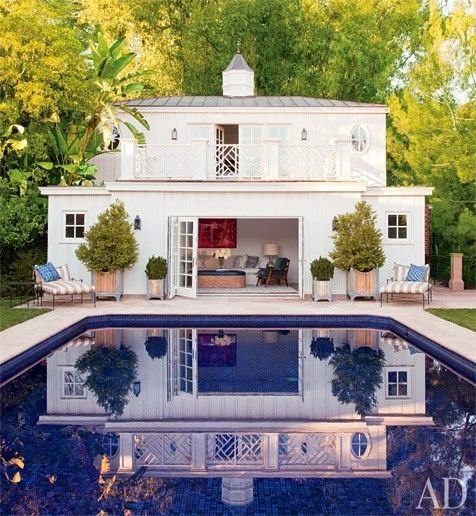 Image via Architectural Digest. Handcrafted artisan porcelain tiles are perfect for pools and water features. The materials and methods used in art pottery are similarly applied to classic porcelain tile-making techniques to achieve rich glazes that excite the eyes and hands. As such, these porcelain tiles embody the charm and appeal of fine handmade ceramic ware. Glaze colors on porcelain offer unparalleled depth, clarity and vibrancy. With the warmth and originality of handmade art tiles, our porcelain pool tile collection is the perfect choice for pools, spas, water features, or any outside space. It should go without saying that each tile is custom manufactured by craftspeople dedicated to preserving the tradition of functional, natural beauty. 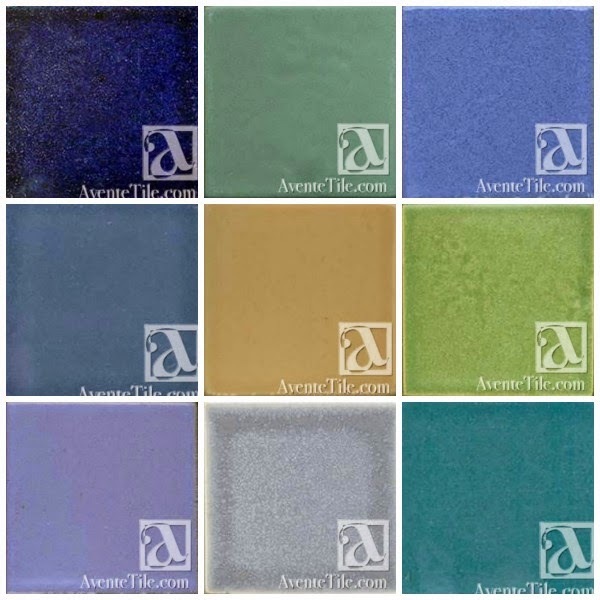 An example of the various glaze colors available with our Pool Tile Collection. 25 vibrant glazes are available in a wide-ranging palette. Porcelain tiles are the optimum choice for pools and spas. Ideal for interior and exterior applications. Porcelain tiles are rated for freeze/thaw conditions. Our tiles are made to order, so please allow 3 to 6 weeks. Sample stock (3"x3") may be available, so please check with us. Other formats, trim and molding available. For additional design options, consider our Spanish Valencia 6"x6" ceramic tile, part of our extensive Spanish Ceramic tile collection. With its historical Spanish pattern and colors, Valencia’s design is created using traditional Majolica glazing techniques. The hand-brushed patterns are a perfect complement to outdoor living areas and water features. Hand-painted glazed ceramic deco tiles with terracotta pavers showcase the stairs, risers and the pool. Image via Houzz | Custom pool tile design by Fariba at Archarium. With the end of spring coming next month, summer's energy is quietly resonating on the horizon. Summer translates to taking on new projects, perhaps one that has been set aside for years. Now is the time to replace cracked or broken pool tile, or installing that fountain or water feature you've always wanted for the garden. Using handmade or hand-painted porcelain tile for your next outdoor project will not only enhance the look of your home, but you can rest assured the tile you choose will withstand the elements, too. For whichever project you choose to conquer, Avente Tile is here to help you reach your design goal. Our extensive Ceramic Tile Design Idea gallery features a large collection of projects dedicated to inspiring you and your living space. How can we help inspire you today?